Throughout history, dogs have accompanied man at work and play. Even in the midst of men’s wars, dogs have been found serving in functions ranging from mascots to weapons of war. 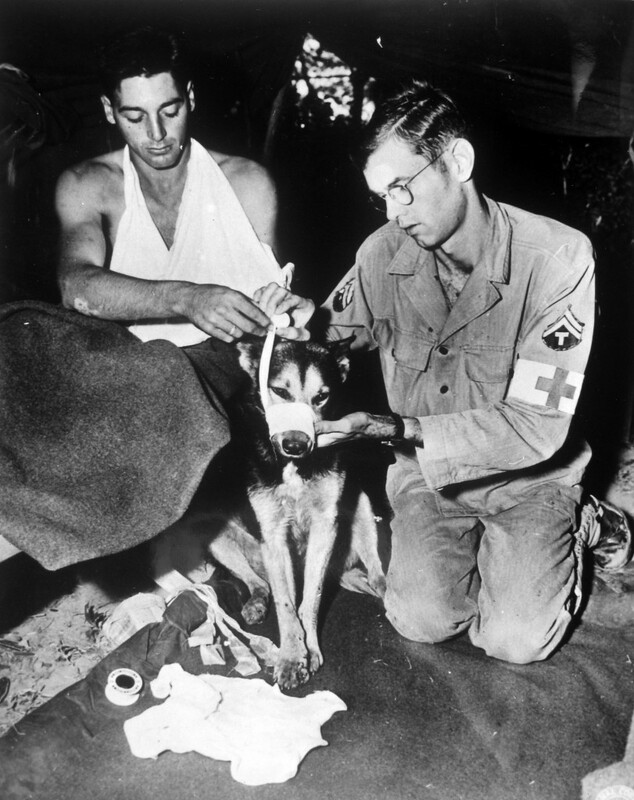 Therefore, it was not without precedence that in 1942, following the attack on Pearl Harbor and the entrance of the United States into World War II, a small group of civilian dog enthusiasts approached the Army about creating a program that would utilize the special traits and skills of “man’s best friend” in order to further the war effort. When the Japanese attacked on 7 December 1941, the U.S. Army possessed only a small number of sled dogs for use in arctic regions. Drawing on the lessons of the past, a group of civilians came together in the belief that dogs could serve the Army in a variety of other functions. These dog fanciers formed a coalition called Dogs for Defense, Inc. (DFD). This organization encouraged dog owners across the country to donate their dogs for training as sentry dogs that would be used to patrol borders, beaches, and industrial facilities in order to prevent sabotage. With the endorsement of the American Kennel Club, DFD quickly began procuring dogs for experiments in training the animals for guard duty under the nominal oversight of the Plant Protection Branch of the Office of the Quartermaster General. In short order, some 100 dogs were procured by DFD and an ad hoc training program was initiated. At first, the volunteer organization was responsible not only for procuring the dogs, but also for their housing and training. However, it soon became apparent that the varying levels of experience among the volunteer civilian trainers and the inconsistent courses of training in different locations led to dogs that were often incapable of performing the duties expected of them. At the same time, the military began to show interest in a variety of different roles for dogs, both on the home front and in combat theaters. 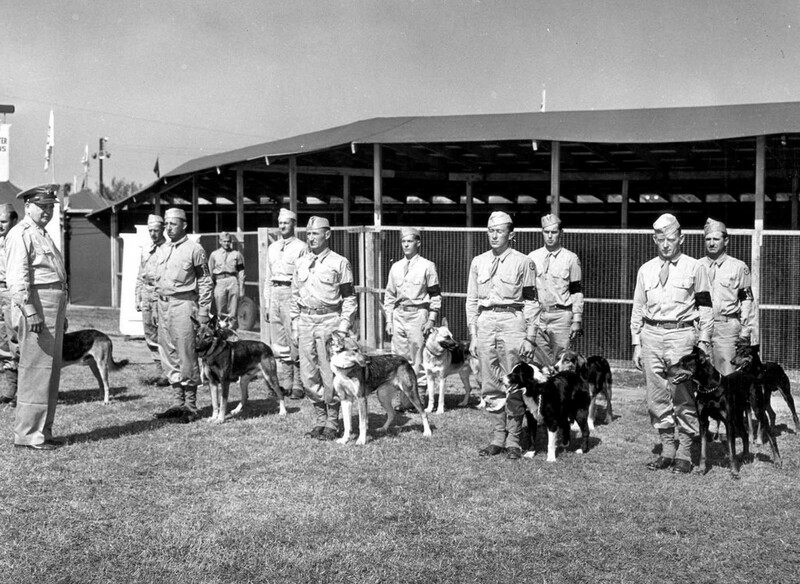 As a result, on 16 July 1942, Secretary of War Henry L. Stimson issued a directive that assigned responsibility for procuring and training dogs to the Remount Branch of the Quartermaster Corps (QMC) and expanded their mandate to include the training of dogs for both sentry duty and possible tactical missions as well. At the outset of the program, DFD and the Remount Branch accepted many different breeds of dogs as long as the dogs were healthy and showed the proper disposition. It was soon discovered, however, that certain breeds were superior to others in performing the types of duties the Army desired, and by 1944, the list of acceptable breeds had shrunk to just seven: German shepherd, Doberman pinscher, Belgian sheepdog, collie, Siberian husky, malamute, and Eskimo dog. These dogs all proved to be hearty in various conditions, eager to work, and capable of the tasks assigned them by the Army. After narrowing the field of acceptable breeds and consolidating control of the program under the Remount Branch, the stage was set for an expansion and formalization of dog training in the Army. The expertise necessary was put down on paper by one of the organizers of DFD, Mrs. Alene Stern Erlanger, who wrote TM-10-396-WAR DOGS, the Army’s first formal training manual on the subject of dogs in warfare. In addition, by the end of 1942, the QMC opened four dog training facilities at Front Royal, Virginia; Fort Robinson, Nebraska; Camp Rimini, Montana; and San Carlos, California. At these facilities, the Army began an ambitious program to train dogs for duties on the front lines and at home. 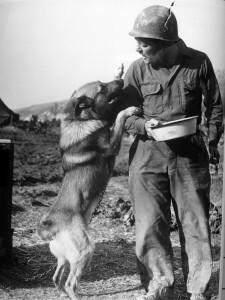 The training of the dogs was certainly important in a successful war dog program, but just as important was the training of each animal’s human handler. It was quickly learned that the dogs worked best if they were trained with their handler and assigned to duty as a pair. This allowed for continuity and the formation of a bond between handler and dog, which would be important once they were in the field. Handlers were taught to care for their dogs’ diet, exercise, ongoing training, and housing. 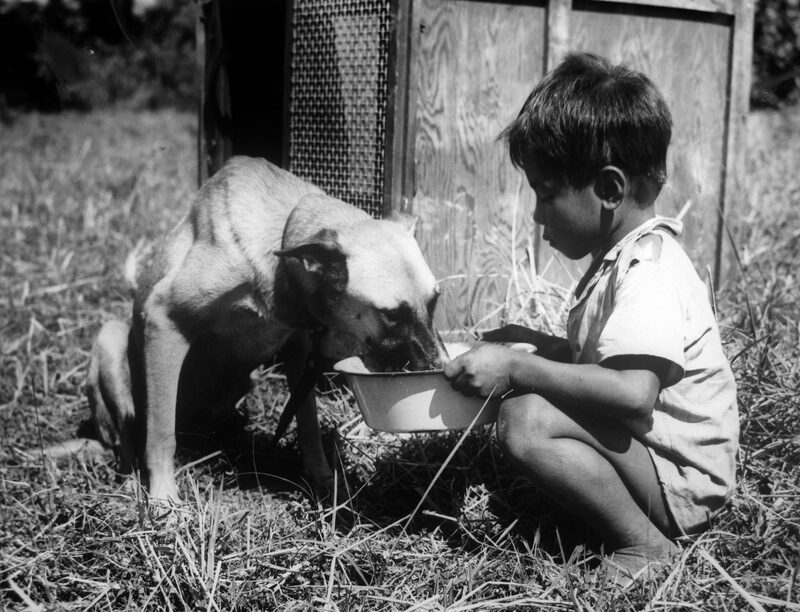 Only handlers were allowed to feed their own dogs, and petting and playing were also limited so that dogs soon considered all but their handler to be a threat. This made the dogs extremely effective at detecting and alerting to unauthorized presences. This sort of training did not always stick with the dog, however, and some became detrained by too much interaction with people on beaches or in other public places. The first of the Army’s canine members were trained for sentry duty. This was deemed the most pressing need since German and Japanese submarine activity off both coasts raised concerns about the potential landing of saboteurs who might be able to gain access to military facilities and important war industries. In response to this threat, dogs were trained to alert their handlers to any strangers in their vicinity, and on command, to attack those intruders. One of the most vital missions performed by these early sentry dogs was the patrol of America’s coastlines. For this task, the QMC-trained dogs were assigned to Coast Guard handlers who used the dogs’ keen senses to patrol the beaches and other areas along the coast. Within a year, more than 1,800 dog teams patrolled the coastlines. By the end of the war, the QMC would assign 3,174 dogs to the Coast Guard. As the tide of the war changed and the threat of submarine-landed saboteurs diminished, emphasis shifted in the training program from sentry dogs for domestic industry to tactical scout and messenger dogs. It was at this time that one of the most bizarre programs in Army history was conceived, a plan to train canines to recognize and kill Japanese soldiers without a handler or other human guidance. The idea for these killer dogs came from an unlikely source. William A. Prestre, a Swiss expatriate living in Santa Fe, New Mexico, approached the government with a bold plan to train dogs for the task. The Army was intrigued by the idea which, if successful, might help keep soldiers out of direct contact with the enemy. Prestre was given control of a contingent of dogs and handlers. In order to mimic conditions in the Pacific theater, the Army leased a small island off the coast of Mississippi. Ironically, this small strip of land in the Gulf of Mexico was known as Cat Island. The entire Cat Island program was predicated on the assumption that Japanese soldiers, whether from diet or racial characteristics, had a distinct odor which dogs could be trained to recognize and attack. Unsurprisingly, the program soon ran into difficulties. First, Prestre had to find Japanese “bait” to train his dogs. It was quickly determined that using prisoners of war was unacceptable. Instead, twenty-five Japanese-American servicemen from Company B, 100th Infantry Battalion (Separate), stationed at Camp McCoy, Wisconsin, were “volunteered” for the assignment. Among those selected was Ray Nosaka, a second-generation Japanese-American (often referred to as Nisei) from Hawaii. On 3 November 1942, Nosaka and his comrades boarded a plane in secret and headed south to a location unknown to them. They made a short stop in Memphis, Tennessee, in order to refuel, but security was so tight that the soldiers were not allowed to deplane, instead eating a hasty lunch of sandwiches delivered to the aircraft while still onboard. When they arrived in Gulfport, Mississippi, they once again were forced to wait. Only when darkness fell were they allowed to exit the plane, and then they were quickly ushered into boats for the trip out to Ship Island, which served as the living quarters for the men involved in the project. Each day, the men would climb into a boat and make the short trip to nearby Cat Island to conduct training. Training the dogs was a slow and brutal process, both for men and dogs. Cat Island was swampy and humid, and while the dogs were being trained to track down the Nisei bait, the men had to simply wait and hide in these unpleasant conditions. Then things got worse. In order to instill an aggressive spirit in the dogs, Prestre insisted on such brutal methods as whipping and shocking the dogs. Nosaka and the others were also forced to abuse the dogs in order to make them more vicious. Then the dogs would be set loose upon the Nisei. For the most part, the men were protected by their padded gear, but a few bites got through, and most of the men ended up with scars from their service on Cat Island. Despite these measures to maximize the aggressiveness of the dogs, they continued to perform poorly. Prestre’s plan to use packs of unguided dogs was further undermined when Master Sergeant John Pierce arrived at the project. Pierce, an army dog trainer, firmly believed that the dogs required human handlers, and he quickly proved his point by training a small contingent of dogs to alert their handlers to enemy presence, and to attack only on command. These dogs attacked with much more ferocity, and proved to be much more effective despite having only a few weeks of training, as opposed to the months Prestre had spent trying to train his dogs. The final straw came on 12 January 1943, when a demonstration was held for officers of the Army Ground Forces (AGF). It was plainly apparent to the officers that the program was not working. In short order, Prestre was released, and the project was abandoned. Assault dog packs were not the only idea being considered, and the Army also conducted experiments in teaching dogs to detect mines. The Germans had begun to use several varieties of non-metallic landmines, which made detection by standard methods all but impossible. It was believed that dogs, designated M-dogs, might be able to detect the mines, and a training program was established. At the time, it was not yet understood how acute the canine sense of smell truly is, and, as a result, training practices were based on false assumptions and incomplete data. The dogs were trained to detect disruption of the ground by humans through a method of self-preservation. Dogs were exposed to partially buried live wires. When the dogs discovered a wire, they received an electric shock. They quickly learned to be wary of any human disturbances in the ground, as presumably, this would allow them to detect mines. In initial demonstrations, these dogs displayed an eighty percent success rate, and this was deemed sufficient. This system was believed to be effective from the one demonstration carried out stateside in a controlled environment, and the 228th Engineer Mine Detection Company (Dog) was established in November 1943. 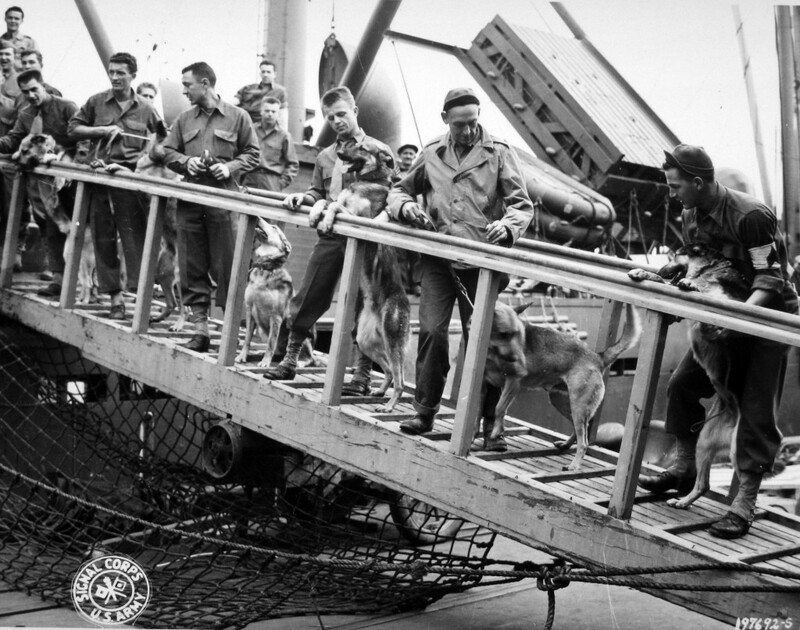 On 5 May 1944, the men and dogs of the unit boarded a ship and embarked for Africa, arriving in Oran, Algeria, on 30 May. They then crossed the Mediterranean to Naples, Italy, and went to work. Unfortunately, the dogs did not perform as expected, and casualties, both of dogs and handlers, quickly mounted in the unit. Another controlled test was performed in Italy, and it was discovered that the dogs had a mine detection rate of only thirty percent. The unit did not perform any further mine clearing tasks, and by February 1945, the company had returned to the United States to be inactivated. The M-dog project was innovative but ultimately doomed to failure. It was determined that the dogs could not distinguish between the deliberately turned earth of mine placement and the rubble and debris caused by shells and bombs. In addition, testing was conducted assuming the dogs would be working behind the front lines, but in actual use, they often had to endure combat conditions which further degraded their efficacy. It was only after the war that it was discovered that the canine’s sense of smell is so acute that they can be trained to pick out the chemical components of explosives. As a result, dogs are currently used to detect bombs and mines with great success. At the same time that the M-dogs were falling out of favor, other tactical dogs began to prove their abilities on the battlefield. In the spring of 1943, a detachment of six scout dogs and two messenger dogs was sent to the Pacific in a test of their usefulness in combat situations. 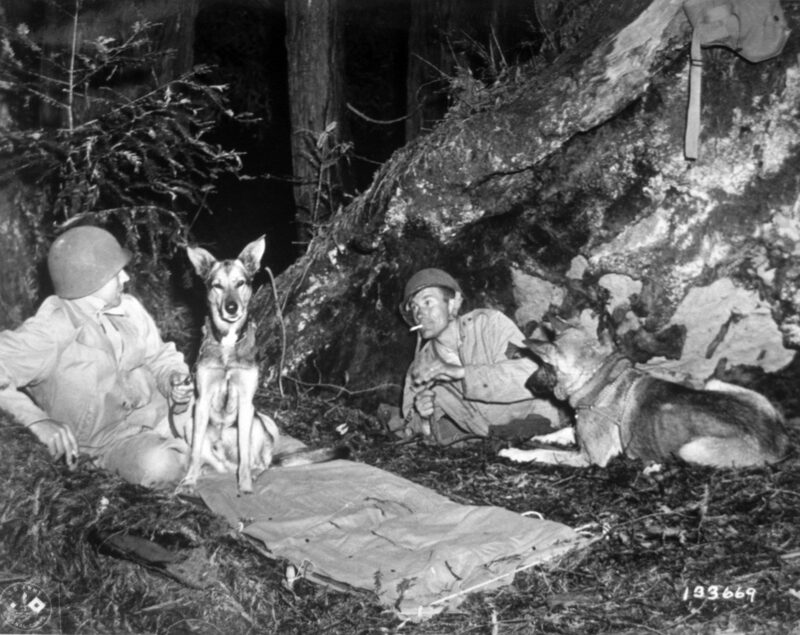 An observer was sent along, and after following the dogs around New Guinea from July to December of that year, he reported back that the animals had performed “consistently excellent.” The most important discovery in this report was that the scout dogs warned their handlers of the presence of Japanese forces at ranges up to 1,000 yards, allowing the Americans to avoid ambush and to gain the element of surprise. The messenger dogs fared just as well. They were observed delivering messages over rough terrain and in short amounts of time over distances of 600 to 1,000 yards. In addition, they presented a much smaller target than a human runner. This was the first true success of the Army’s canine programs in combat, and while some weaknesses were exposed, training in these fields was quickly modified and expanded with superb results. Two major weaknesses were identified by the 1943 report. First, the stateside training of the dogs included acclimatization to gunfire, but the program failed to address a major component of frontline combat: artillery. The dogs had no experience with artillery fire, and once on the front, they quickly became skittish and ineffective when in the presence of an artillery bombardment. The other shortcoming was that, from time to time, the dogs would bark at night or when they sensed the enemy, effectively giving away their position and that of any accompanying troops. As a result, the Army adjusted its training regimen to address these issues, adding artillery fire to the course and stressing silence at all times. By June 1944, the War Department had authorized the creation of fifteen Quartermaster war dog platoons. These units had their own Table of Organization and Equipment that included eighteen scout dogs, sixteen messenger dogs, twenty enlisted men, and one officer. All fifteen platoons were shipped overseas by the end of the year, seven to Europe and eight to the Pacific. Once in theater, another obstacle revealed itself. While in the United States, both dogs and handlers were provided and trained by the QMC, so when they arrived at the front and were attached to infantry units, they often lacked the tactical expertise necessary to effectively carry out their duties. This brought on more changes, and by December 1944, the table of organization had changed once more, eliminating all messenger dogs. In addition, handlers were picked from AGF units so that they entered dog training already having the skills necessary for infantry operations. Even before all these issues had been addressed, army dogs and their handlers got to work assisting soldiers on the battlefield. The first unit to go overseas was the 25th Quartermaster (QM) War Dog Platoon which left San Francisco on 11 May 1944 and arrived at Guadalcanal on 6 June. By the end of June, they had travelled to Bougainville and joined the 164th Infantry in mopping up the Japanese forces on the island. The dogs performed well, and reports indicated that the infantry troops appreciated the dogs and the service they performed. The second platoon to arrive, the 26th, accompanied soldiers of the 41st Infantry Division on New Guinea and the surrounding islands. It was shortly thereafter assigned to the 31st and 32d Infantry Divisions. On Morotai, in the Dutch East Indies, the 31st Division used the 26th QM War Dog Platoon to help conduct 250 patrols in the course of two-and-a-half months. In this period, not a single one of these patrols was ambushed, proving the invaluable nature of the scout dogs who could alert soldiers to the presence of the enemy at distances ranging from seventy to 200 yards away. Often, the advanced warning of the scout dog enabled GIs to reverse the odds and surprise Japanese defenders. For the invasion of the Philippines, the 25th, 26th, 39th, 40th, 41st, and 43d QM War Dog Platoons were attached to various infantry units. By this time, the effectiveness of the dogs was well known, and there were not enough to go around for all the units that requested them for their patrols. 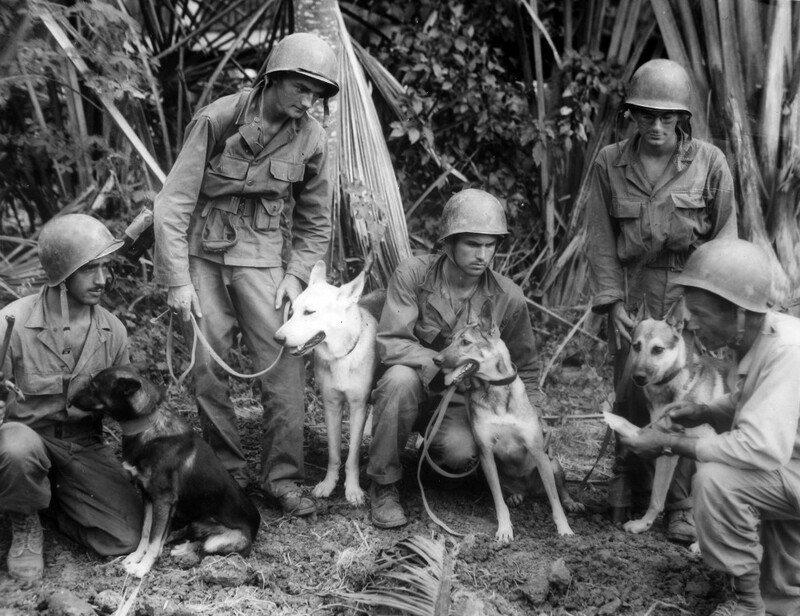 The dogs were invaluable in the jungle warfare that characterized much of the combat the Pacific Theater. The thick jungle limited human effectiveness, reliant on eyesight and hearing, but the dogs could smell the presence of the enemy despite the obstacles. Dogs were found to be much less effective in the open, fast-paced fighting in Europe, though they found use there as well. Artillery was more commonly used in Europe, and despite training, intense shelling still caused dogs to become skittish and lose effectiveness. Often Allied troops were making such rapid advances against the Germans, especially in the closing days of the war, that dogs were of little use, so they were relegated to sentry duties. Still, dogs did prove themselves useful in some situations. In a report to the Quartermaster, Fifth Army, dated 25 December 1944, First Lieutenant Austin Risse told the story of the actions of Corporal Robert Bennett and his dog assigned to the 33d QM War Dog Platoon in Italy. According to the report, Bennett and his dog were leading a patrol in enemy territory to reconnoiter a small village. As they approached, the dog halted, nose pointed and hair bristling. When the patrol leader crept forward, he discovered a large group of German soldiers waiting in ambush less than 200 yards away. As a result of the dog’s action, the patrol withdrew without casualties and ordered in mortar fire on the enemy position, wiping it out. Another dog in Europe also had the distinction of being the only canine to receive decorations for action. “Chips” was a German shepherd-husky-collie mix who, along with handler Private John Rowell, was attached to the 30th Infantry, 3d Infantry Division. On 10 July 1943, the division landed on Sicily, and Chips and Rowell went to work. As they approached a grass-covered hut, a machine gun opened fire. The hut was, in fact, a camouflaged bunker. Chips quickly escaped Rowell’s control and made a beeline for the bunker. Within seconds, the machine gun fell silent and an Italian soldier tumbled out with Chips chomping at his throat and arms. In short order, three others exited the bunker with arms raised. Chips was lightly wounded in the incident, suffering powder burns and several cuts. On 24 October 1943, Headquarters, 3d Infantry Division, issued General Order No. 79, which included a citation for the award of the Silver Star to “Chips, 11-A, U.S. Army Dog.” A short time later, he was awarded the Purple Heart. Regulations technically prohibited such an award, and there was some controversy over whether awarding medals intended for humans to dogs was appropriate. In the end, the awards were rescinded, and future such awards banned. Chips went on to serve the Army for another two years and was discharged to his prewar owners on 10 December 1945. Following the war, many dogs were returned to owners or given to their wartime handlers. This involved retraining so the dogs would be able to function safely in a peacetime civilian setting. Due to their classification as government property, any unclaimed dogs had to be sold as surplus, with the new owner footing the bill to return the shipping crate and food bowl to the Army. Still, this program allowed some civilians to purchase a well-trained and physically fit animal for a bargain price. The Army took great care in retraining its dogs. The program included handling by multiple people to lessen the dogs’ aggressive tendencies. They were encouraged to play and rewarded for good social behavior. Eventually they would be exposed to an aggressive person and trained not to react aggressively. A few dogs were incapable of retraining or had untreatable diseases and were destroyed, but the vast majority were carefully processed by the QMC and eventually sent to civilian homes. In the end, more than 15,000 applications were received for the returning dogs, and each dog was given a certificate of faithful service and an honorable discharge certificate. Of all the dogs returned to civilian life, about 3,000 in total, only four were returned to the Army as unsuitable for civilian life. Both dogs and handlers provided an invaluable contribution to the American war effort in World War II. Despite the almost constant peril and close combat experienced by scout dog platoons, handlers were ineligible for the Combat Infantryman Badge due to their assignment to the Quartermaster Corps. Though man and beast alike may not have received the credit they deserved during the war, they proved their worth and pioneered many new tactics. Their legacy can still be found in the military working dogs of the modern Army and the explosives-detecting dogs used by both the armed forces and government agencies.